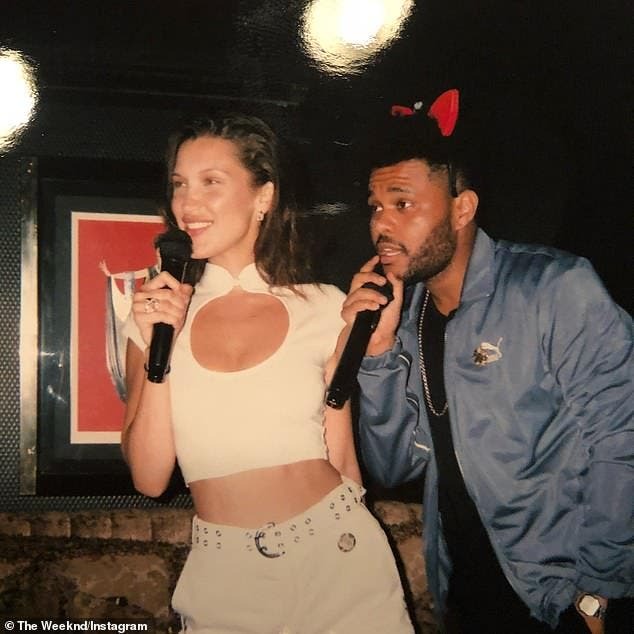 Three-time Grammy winner The Weeknd was the first to wish his on-again 'angel' Bella Hadid a happy 22nd birthday at midnight EST on Tuesday with a PDA-filled tribute. It was a romantic, over-the-top move for the Canadian 28-year-old, who rarely posted about the IMG Model during their on/off relationship dating back to early 2015. In one shot, the R&B crooner rocked a red-eared headband while appearing to sing karaoke with the half-Jordanian, half-Dutch socialite. In another picture, The Weeknd (born Abel Tesfaye) and Bella locked lips while immersing themselves inside Tokyo's Mori Building Digital Art Museum back in July. Hadid and the Oscar nominee have been nearly inseparable since they officially rekindled their on/off romance during the Cannes Film Festival in May. Before that, the Pray for Me belter enjoyed a nine-month fling with Selena Gomez, which ended a year ago. 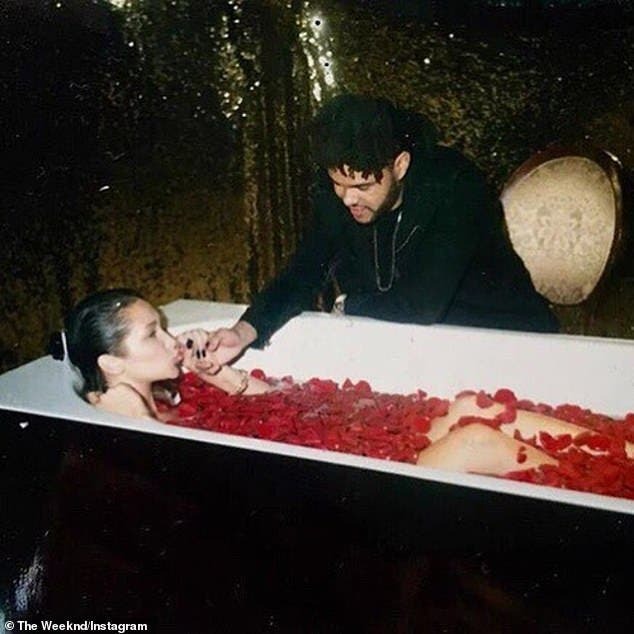 The Weeknd also shared a BTS snap of the Victoria's Secret catwalker bathing in rose petals on the set of his music video for In the Night. Bella was beaming from ear to ear on Monday night in Manhattan as she stepped out for a pre-birthday celebration. The Harper's Bazaar Arabia cover girl - who relies on stylist Mimi Cuttrell - wore glasses and she bundled up in a golden quilted bomber, unflattering blue jeans, and a black hoodie. Joining Hadid was her 23-year-old sister Gigi, who was wearing sunglasses at night along with a navy hoodie, blue slacks, and black Oxfords. The IMG Model (born Jelena) is also on-again with her own singing beau Zayn Malik, whom she's been dating for around the same span of time as Bella and her man. The Weeknd will most likely skip Tuesday night's American Music Awards ceremony in Los Angeles (broadcast by ABC) despite being nomniated for the soul/R&B male artist trophy.